MERCEDES THOMPSON:	In both the House and the Senate right now there’s a bill being passed that would ban expanded polystyrene in corner stores, supermarkets, even the packing peanuts that you see in shipping. You hear all the people coming in from the big oil lobbyists, researchers that are funded by Exxon, trying to oppose this bill because, at the core of it, polystyrene is an oil-based product, and it would mean less money for them if someone took away their ability to continue funneling toxins into students and youth across our city. 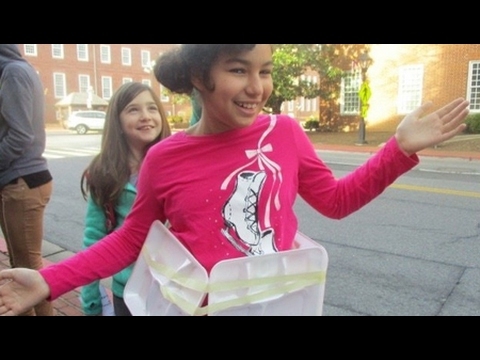 The students all… we went and we toured the Annapolis State House. We got a tour about the legislative process, how it works. Some students got to pose with George Washington, the statue. And then we met as a huge group to take pictures with senators and legislators so that the students could let them know how they feel about the Styrofoam. STUDENT:	Do not – do not put me into the trash can! Put me into the recycling! Recycle it! Recycle me! MERCEDES THOMPSON:	It’s not just the environment that’s affected. It’s also the students themselves, because the Styrofoam is being burned and causes air pollution, releases toxins into the air, which they then breathe, and also, as students, we eat off of Styrofoam trays. Styrofoam leaches toxins into hot food, which we then consume, and those toxins stay with us for years. And it’s just really upsetting because we’re young people and we’re growing and our bodies are maturing and have these toxins basically being put into us. It’s just really upsetting. So, I believe in Prince George’s County and Montgomery County right now, this ban has been put in, and also in D.C. I believe that Styrofoam has also been phased out in San Francisco. So, right now, Claire and I, the co-founders of Baltimore Beyond Plastic, we’re meeting with different councilmen. We’ve already met with three, and we’re going to be meeting with six more this Friday, about maybe a bill that might be passed in Baltimore City, at the Baltimore City level, that independent of the State of Maryland, phasing out polystyrene products from businesses in Baltimore City. Actually, we have a pre-rally meeting coming up, and also our Styrofoam Rally on March 3rd, and we’re going to be bringing in students from Baltimore City public schools again to talk and we’re also having guest speakers to speak out about the Styrofoam problem in our city and in our state. So far, we have Councilman Cohen who has agreed to be our guest speaker, and we’re hoping for a few more prominent speakers, as well. If anybody would like more information about our initiative, Baltimore Beyond Plastic, and other youth advocacy efforts across the city that we’re working on, they can visit Bmorebeyondplastic.org for more information.